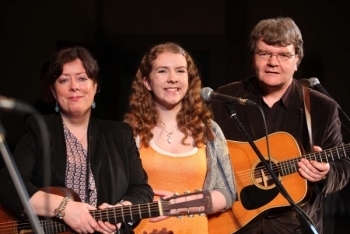 Is a trio comprising Noel Shine and Mary Greene and their daughter, Ellie Shine. While Noel and Mary have released three critically acclaimed albums to date: THE LAND YOU LOVE THE BEST (listed in the top 3 folk albums of its year of release by The Irish Times), UNSPOKEN LINES and SEA OF HEARTS, a cd of Mary’s songs. GREENSHINE sees the launch not only of a cd but a band name to incorporate their daughter Ellie into the musical mix. The trio are known for their tight family harmonies.